Toolcraft Inc. uses state-of-the-art technologies in all areas of production to take your solution from conception to completion. Our commitment to our values and our ability to evolve has allowed to grow and develop our unique service. Proprietary systems that allow us to quickly automate, even on small production runs. Advanced application of Computer-Aided Design (CAD)/Computer-Aided Manufacturing (CAM), through which we create processes that increase efficiency by cutting multiple sides of a part in one operation, reducing machining and handling time. Our ability to take on the production of difficult “problem parts” that require micro-machining, have very tight tolerances, or are composed of tough material. While we take advantage of the latest technologies available, our greatest asset is the people who work here. The dedication and professionalism shown by all staff members is what keeps Toolcraft Inc. on the cutting edge. Select a capability for a deeper look. With our process-oriented approach, we are always looking to design the most efficient solutions that meet and exceed design specifications. 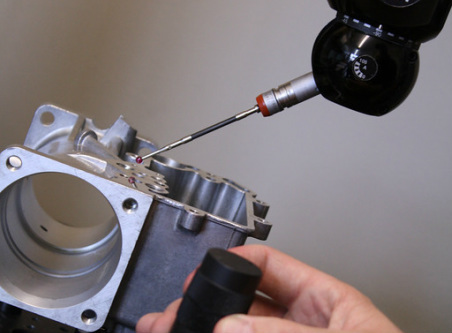 Expertise with CAD / CAM design and tooling software allows us to go far beyond parts programming. designing the part. Produce close-tolerance parts in one operation with amazing speed and consistency, while eliminating lengthy de-burr operations that introduce human error. With both horizontal and vertical machining centers we can manufacture extremely precise, consistent, and burr free parts for a wide variety of size, feature, and attribute requirements in as little as one operation using our lean automated systems. Machine larger parts with conventional CNC turning machines and methods. Maximum Through Spindle Diameter: 2.0"
Ensure that parts meet and exceed specifications using a variety of manual and digital tools that can check any manufactured specification. Data is gathered, shared, and analyzed all throughout the manufacturing process for continuous process improvements.